Western Australia - First Time Winners !! The Western Australian tour provides a variety of golf courses and conditions to test all our golfers over the 7 rounds we played. From the links style courses of Kennedy Bay, Secret Harbour and The Cut to the Robert Trent Jones Jnr designed courses of Meadow Springs and Joondalup. The 39 degree heat at The Vines also added another challenge to everyone who played. It was a real test of our players tenacity and adaptability to the changing courses. After leading for sometime Dirk Seret from Mt Osmond struggled with the heat at The Vines to relinquish the lead to Peter Tanner (Pelican Waters) going into the final round, with Mike Ward 4 shots back. Bob White from Castle Hill (Hcp 5) stunned everyone with a one under par round on the Quarry / Dunes course at Joondalup returning 42 points. Bob followed that up with an even par round on the Lakes / Dunes course 2 days later. Peter Tanner returned 38 points in the final round which would normally guarantee a win when you have a two shot lead. 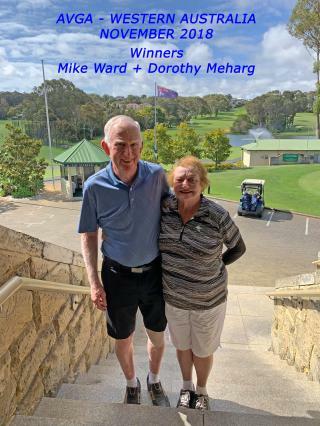 But Mike Ward (North Ryde - Hcp 13) who had been very consistent over the previous 6 rounds came in with a wonderful 43 points - 6 over par 78 - to get up and win from Peter Tanner by 3 shots and win his very first AVGA Tour. The Ladies initially became a tussle between Yvonne Murray (Blackheath) Jill Levi (Nowra) and Dorothy Meharg (Wollongong). But again the heat at the Vines Resort took a toll on many of the girls and Jill Levi was able to get to one a shot deficit behind Dorothy Meharg going in to the final round. But Dorothy saved her best round for last - returning 41 Points and put no doubt on the result and secured her first win with the AVGA.